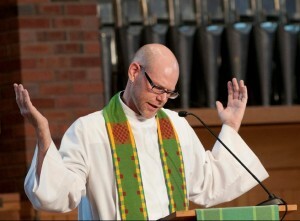 PASTOR JUSTIN LIND-AYRES has been serving at Augsburg University since August of 2013. Prior to his arrival, he was the pastor at Bethany Lutheran Church in Minneapolis, the associate pastor at Good Shepherd Lutheran Church in Woodstock, Georgia, and at Pilgrim Lutheran Church in St. Paul, Minnesota. Justin attended Gustavus Adolphus College in St. Peter, Minnesota, for undergraduate studies where his most important achievement was meeting his life partner, Melanie. His is quick to declare, “My beginning ballet course paid off in spades!” Melanie and Justin were married at Christ Chapel at Gustavus in 2001 and have three lively, young children, Anya, Svea, and Soren. Melanie lives out her vocational calling as a pediatrician for Park Nicollet in St. Louis Park. The Lind-Ayres’ family is active at their neighborhood congregation, Edina Community Lutheran Church in Edina, MN. Justin received his Master of Divinity from Luther Seminary in St. Paul and his Doctor of Ministry from Columbia Theological Seminary in Decatur, Georgia. Justin is passionate about liturgical studies, preaching, social justice issues, and the power of biblical metaphors in the lives of the people of God. He is borderline obsessive about the sacraments of baptism and holy communion, and firmly believes that in and through the water, wine, wheat, and word we experience the transforming love of Christ. Formed by campus ministry as a student at a college of the Evangelical Lutheran Church in America (ELCA), Justin now rejoices in his call at Augsburg’s Campus Ministry Office to work alongside students, faculty, and staff in shaping Augsburg to be a community sharing Christ’s transformative love through radical hospitality and service to the neighbor. When not working with the wonderfully talented Campus Ministry staff at Augsburg, Justin can be found spending time with his family, cooking, reading, drinking coffee, watching sports and an occasional movie, and fly fishing for steelhead and trout.